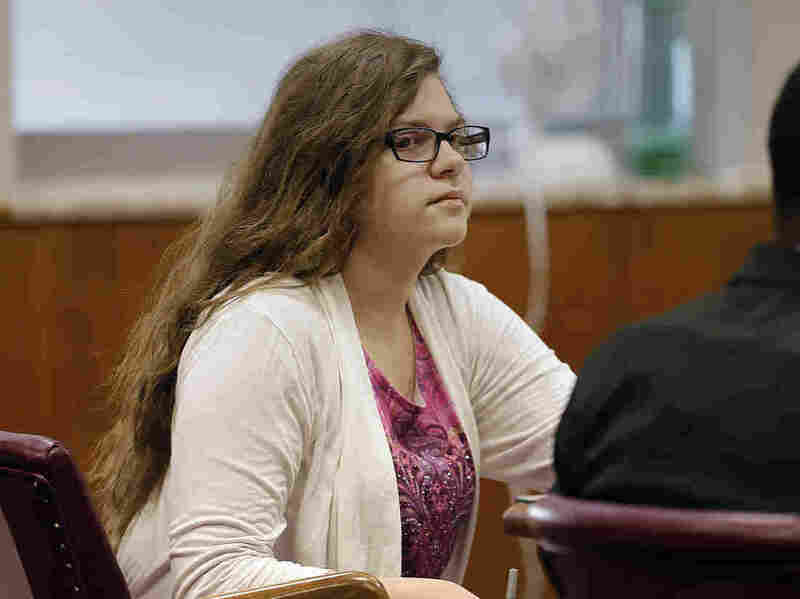 Teen Gets 25 Years In Mental Hospital In Wisconsin's 'Slender Man' Stabbing : The Two-Way In 2014, Anissa Weier and classmate Morgan Geyser lured another girl to the woods and stabbed her multiple times in an attempt to impress a fictional Internet character. Anissa Weier listens as former teachers testify during her trial in Waukesha County Court in Wisconsin in September. A jury agreed that she was not responsible for her actions because of mental illness. 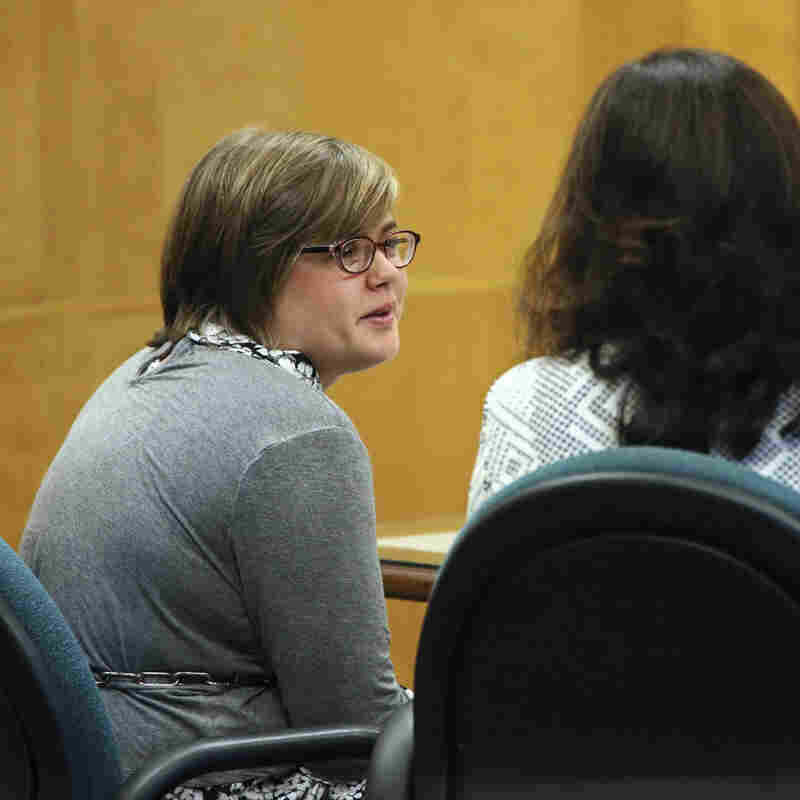 One of two Milwaukee-area girls charged in the 2014 attempted murder of a classmate to impress a fictional horror character known as "Slender Man" was sentenced Thursday to 25 years in a mental hospital. Anissa Weier, 16, had pleaded guilty in August to being a party to attempted second-degree homicide. However, a jury agreed in September with her claim that she was not responsible for her actions because of mental illness. The finding by the jury ensured that Weier, now 16, would be sent to a mental hospital for not less than three years. The sentence of 25 years is the maximum under the circumstances. The bizarre case centered on classmates Weier, now 16, Morgan Geyser, who is now 15, and victim Payton Leutner. As member station WUWM in Milwaukee reports, in spring 2014, when all three girls were 12, Geyser and Weier "attacked [Leutner] in the woods in Waukesha, leaving her to die. The victim was able to crawl from the site of the attack and flag down a bicyclist who came to her aid." "Weier and ... Geyser said they planned the stabbing in order to please the Internet horror character Slender Man. Attorneys for Weier argued that she believed Slender Man would harm her family if she did not attack her classmate," according to WUWM. According to the criminal complaint filed in 2014, one of the girls said, "Many people do not believe Slender Man is real," and that the girls "wanted to prove the skeptics wrong." The two were tried as adults. Geyser pleaded guilty in September in a deal that would also have her committed to a mental institution, rather than going to prison. Co-defendant Morgan Geyser pleaded guilty in September in a deal that would also have her committed to a mental institution, rather than going to prison. Waukesha County Circuit Judge Michael Bohren sentenced Weier retroactive to the date of the crime, meaning she will be institutionalized until age 37, The Associated Press reports. Before her sentencing, Weier issued an apology for the crime. "I do hold myself accountable for this and that I will do whatever I have to do to make sure I don't get any sort of delusion or whatever again," she said. "I want everybody involved to know I deeply regret everything that happened that day. I know that nothing I say is going to make this right and nothing I say is going to fix what I broke," Weier said. Geyser's sentencing is scheduled for February. During testimony in October, she broke down in tears. "Anissa and I took [Leutner] in the forest and said that we were going to play hide-and-seek," Geyser said, crying. "Anissa said that she couldn't do it and that I had to." Bohren asked how Geyser carried out the attack, to which she replied: "I tackled her. I stabbed her." Where? Bohren asked. "Everywhere," Geyser replied. How many times? "19." "Anissa told her to lie down so she wouldn't lose blood so quickly, and told her to be quiet, and we left," Geyser said.